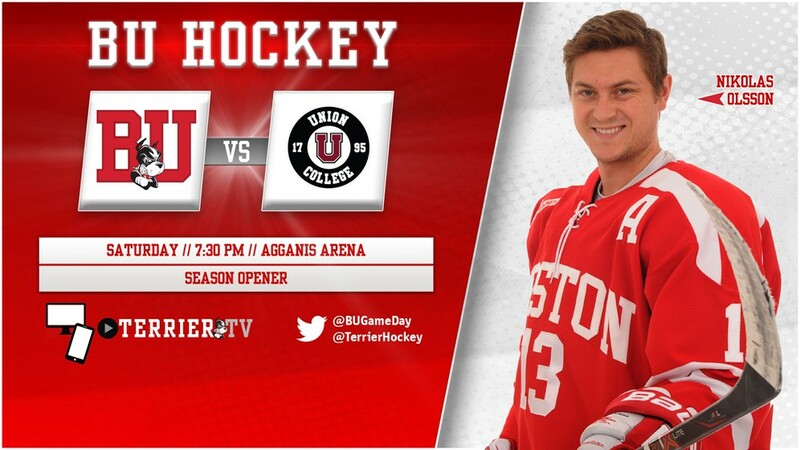 The 96th season of Terrier Hockey begins tonight as #2 BU hosts #16 Union College with a 7:30 p.m. start at Agganis Arena. The contest, which marks BU’s first-ever regular-season game in September, will be live-streamed on TerrierTV (via watchstadium.com). The game also can be heard on the Terrier Sports Radio Network. Last season, BU rallied past the Dutchmen, 5-4 (video), with Jakob Forsbacka Karlsson scoring a third-period tying goal and an overtime game-winner to complete his hat trick. With the win, the all-time series with Union stands at 1-1-1. With 17 returnees from last season’s 24-12-3 squad and 10 newcomers, BU will be led on offense by sophomore Patrick Harper (37 points) juniors Bobo Carpenter (32) Jordan Greenway (31 points) with contributions expected from freshmen Brady Tkachuk, Shane Bowers and Hank Crone. BU’s defense is led by returnees Dante Fabbro (18 points, photo), captain Brandon Hickey (15), Chad Krys (11) and John MacLeod (8). Sophomore goalie Jake Oettinger, who was drafted in the first round by Dallas this past June, earned Hockey East All-Rookie honors with a 2.11 GAA and a gaudy .927 save percentage. For Union, which like BU reached the NCAA tournament last season, the offense begins with juniors Sebastian Vidmar (41 points), Brett Supinski (36) and Cole Maier (28). The likely new starter as goalie is junior Jake Kupsky. ►In Episode 1 of Inside BU Hockey, head coach David Quinn previews the 2017-18 season with longtime Terrier play-by-play broadcaster Bernie Corbett. 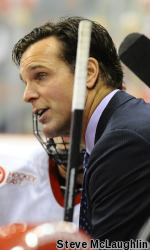 ► Joining Hickey on the BU leadership team are assistant captains Greenway, Carpenter and senior Nikolas Olsson. 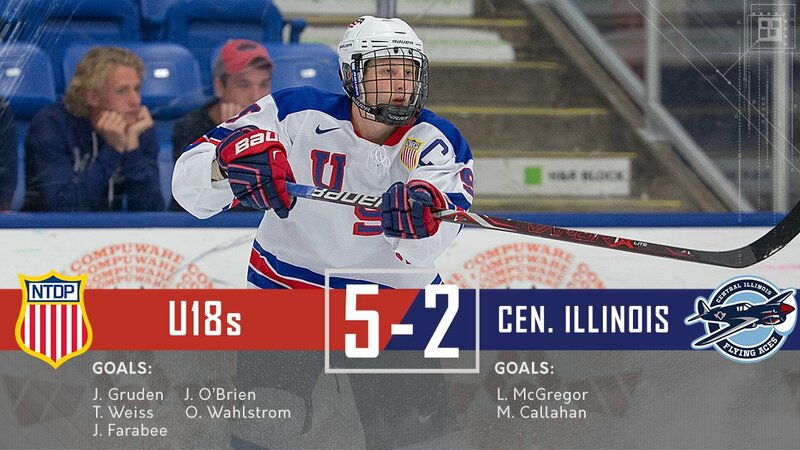 2018 recruits Joel Farabee and Tyler Weiss (photo) each scored unassisted goals ten seconds apart in the third period to lift the NTDP U18s to a 5-2 win over Central Illinois in the USHL Fall Classic in Cranberry, Penn. With Team USA trailing, 2-1, Farabee tied the score with his third goal of the season and Weiss followed with the game-winner. Weiss also assisted on a pair of goals and Farabee added a helper as one future Terrier had a hand in all five goals. A panel of 17 NHL.com writer ranked the rookies most likely to win the Calder Trophy this season. Bruins' blueliner Charlie McAvoy was ranked #2 and Coyotes' forward Clayton Keller is slotted at #3 behind this past June's first draft pick, Devils' forward Nico Hischier.